If 2017 is your year to get out from under those payday loans, you’ve come to the right place. 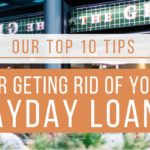 It’s a new year and a new opportunity, and we’re going to share with you our best tips for paying off your loans and escaping the payday loan cycle this year. 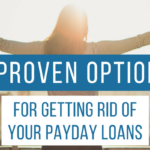 Our team of payday loan consolidation experts works with people, like you, every week to help them consolidate their loans, get lenders out of their bank accounts, and get out of payday loan debt. Payday loan consolidation is a great first step to help you get out of payday loan debt. Contact us today by filling out this form to find out more! 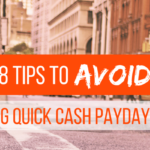 If you’re already using payday loan consolidation, or if that’s not an option for you, here are more tips for paying off debt this year! Make a plan and stick with it.. Making a budget doesn’t matter if you’re not sticking with it. Don’t overspend. Don’t buy things you don’t really need. And avoid all of those oh-but-I-really-need-this temptations. By using, and sticking to, a budget, you can get out of debt fast. A budget helps you plan ahead to know how much extra money you’ll have to put towards your debt every month. In order to pay off debt, you need to be able to pay more than your minimum monthly payment. Using a budget can help you do that. It will also help you see where you’re overspending, and can help ensure that you don’t. Ask your friends and family to hold you accountable. Set monthly goals for yourself that are easy to reach and create a small (and inexpensive) reward for yourself if you reach the goal. Use an online budgeting tool to make it easier (and take your budget with you on the go). You know that raise you’ve been waiting for at work? Ask for it. If you’ve been doing a great job and it’s been at least a year since you received a raise, schedule some time to sit down with your boss and ask. Waiting for a raise isn’t getting you any closer to actually receiving it. So, ask for it. Or, if a raise isn’t an option in your current job, find a higher paying opportunity. More money in your pocket each month means more debt you can pay off each month, as well. And the more money you’re able to put towards your debt, the faster you’ll be payday loan debt free. So, ask for the raise. Or spend some time looking for higher paying work opportunities elsewhere. A side hustle is a great way to make some extra income in addition to your main job. It’s a part-time gig that utilizes your skill set – think photography, graphic design, freelancing, etc. Depending on what you do and how much time you spend doing it every month, a side hustle can bring in several hundred to several thousand extra dollars every month. And with most side hustles, you can find work that aligns with your skill set and requires zero upfront cost. It’s an easy way to increase your income, find extra work in your free time, and pay off debt. Side hustles are great options for earning extra income both temporarily and long-term. For more ideas, take a look at this list of 99 side hustle ideas and find one that matches up with your strengths and skill set. A quick google search will give you hundreds of ideas and options and places to start. As Benjamin Franklin so wisely said, “By failing to prepare, you are preparing to fail.” Planning ahead of time allows you to prepare for unexpected expenses, save up when needed, and pay off debt. Set time aside to sit down and make a plan for your money. Plan to save money for birthday, holidays, and other gifts throughout the year. Make a plan for how you’re going to handle the non-monthly expenses like oil changes, new school clothes for the kids, etc. And prepare for the unexpected expenses, as well. By preparing and saving ahead of time, you’re preparing to not have to turn to more payday loans to cover the next unexpected expense. You never plan to get a flat tire, chip a tooth, or have to rush the dog to the emergency vet. Most all financial emergencies are unplanned. You don’t know when they’re going to happen and you’re not given any notice. But you do know that they will happen, eventually. So, plan ahead, create an emergency fund, and be prepared. Getting out of debt is hard. It’s OK to ask for help. Reach out to your family and friends and ask for support, guidance, or accountability. Share your goals with others and let them cheer you on and help encourage you. Reach out to a financial advisor if you’re having trouble getting your finances in order. If you’re working towards paying off payday loan debt, consider payday loan consolidation. Ask for help! Stop turning to more debt to bail you out of financial troubles. As long as you continue taking on more debt, you’re going to stay in debt. You quit the debt hustle by no longer putting yourself in the position of needing more debt. That means being intentional with your money, using a budget, planning ahead, creating an emergency fund, and setting money aside for unexpected expenses. Once you commit to not taking on any new debt, you can finally make the first steps to paying off debt. Getting out of debt is less like a race and more like a marathon. It doesn’t happen overnight. So, take baby steps. Set small goals for yourself that are easy to achieve. Rather than focusing on one giant goal, take that and divide it up into smaller, more manageable goals. For example, instead of focusing on your big goal of paying off $10,000 in debt, break it down into monthly goals of $1,000 each month. Baby steps are more manageable than taking big, giant leaps. And if you’re working towards smaller goals, you’ll be more likely to stay motivated and on track. This is your year! You can do it. Put all or a few of our above tips into action and watch the giant debt-paying-off leaps that you make! 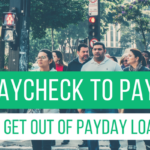 If you’re trying to pay off payday loan debt this year, we’d love to tell you about our team and how we can help you get out of debt faster with payday loan consolidation. Contact us today to find out more.